An audit can be scary, intimidating, especially for someone who’s never been involved in one. 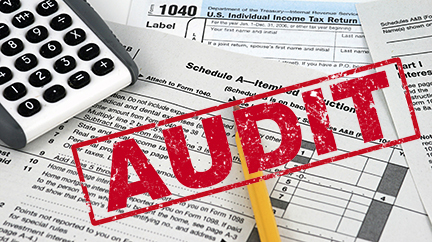 The stats say that about 1% of taxpayers get audited every year. Those audited are usually in a higher tax bracket, however not always. And many times, the audit will show up inconspicuously in the mail, a straight-forwardly-written document from the IRS that’s written with very official sounding language. And it’s that it’s so official that it sounds scary: it sounds like you’ve done something wrong, maybe something criminal. But an audit doesn’t mean you have done anything wrong, at all. The IRS states that tax documents are complex and that the data contained must be evaluated to determine its accuracy. Not all audits are performed because of discrepancies or unusual deductions (although these are reasons), but some audits are performed to match income documents and others decided by random sampling (Lucky You!) So, what do you do when one of these letters shows up in the mail? First, the IRS is not going to “go away” if you choose to not respond to their query, so do that first—they may also call you on the telephone, so don’t panic when/if they do (also, if it turns out you owe the IRS money, then interest on the money owed could be compounding, so get on it). And then get together all the paperwork that they are requesting, if they have. More than half of all audits are done through the mail. If there are simple errors like incorrect math, these errors can be easily remedied. Make sure that you have all the paperwork (it’s best to keep up to five years of tax filings somewhere safe—like a file cabinet) and if you do not have a certain document request a copy be sent. And, contact Practical Taxes to go over your audit before you send in all your materials (if, in fact, the IRS is saying that there is a discrepancy). If you have any questions during an audit, call. Your accountant at Practical Taxes is here to make the audit process less scary.